Candytopia Museum of Candy in Santa Monica! If you follow me on Instagram, you know there's nothing I love more than a good old Intagram museum. I bought tickets for Candytopia when it was very first announced, and it went through a little bit of permitting trouble, so it never opened at its first location. After some administrative shuffle, it finally opened in Santa Monica and I was super pumped to check it out. It did not disappoint! I, like any good Instagram obsessed blogger, brought two outfits to wear, and the photo ops were super cute AND I got a lot of candy. I have a cavity growing in my back left molar, but I figure if I'm going to get it filled anyway I might as well go hard. This Van Gogh recreation was all made using candy! No instagram museum is complete without a pit full of some inedible replica of food! The Scream by Edvard Munch candytopiad! You can still get tickets at Candytopia.com, they're $30 for adults and $23 for children 4-12. Under 4 is free! If you're in LA, you should definitely check it out! This week my man and I visited the Museum of Illusions, a pop up art museum here in Los Angeles. It was SO COOL. I love these places that have become really popular in LA, my husband makes fun of me for it because he says it's just for Instagram photos, but I know he secretly enjoys it just as much as I do. I really loved the simple outfit I put together with the accent scarf I stole from my mom, the queen of scarves. It was really cool to walk around and see how the artists involved created these optical illusions, some of them were really mind blowing! Check out some of the other fun pictures we took during our visit to the Museum below! For the holidays parents, my brother, and his wife are traveling here to LA from Michigan and the Bay Area, and THEN we're all getting on a bus run by a Korean travel tour company and going to Vegas and the Grand Canyon. That's right, me, my man, my brother and his wife, and like 30 Korean senior citizens are goin' on a trip. It is going to be hilarious, I have no doubt about this. As I'm preparing for my trip, I wanted to share my top ten tips and tricks for making road trips or bus trips easy and fun! This is an obvious one, probably, but I don't always remember or make time to make lists because I think I'm too smart and that I'll remember everything. Without fail, every time I try to pack without making a list I will forget something. To avoid forgetting stuff, use your notes app or reminder app on your phone or get out a good ol' pen and paper and make a list- plus you'll feel like you accomplished something each time you check something off the list! I'm straight up addicted to my phone, and wouldn't make it through a long day on a bus without a portable charger. They come in a wide range of price ranges and styles, so pick the one that suits your needs the best. If you have a phone with a removable battery, consider buying an extra battery to easily switch out when you are running low on juice. I take this MyCharge portable battery charger ($89) with me everywhere and it can get you from red to a full charge multiple times and is compatible with iPhones and most Android phones. You can sign up for their e-mail list to get a 30% discount off your first purchase, but if this out of your price range, there are tons of more affordable options on Amazon and at other stores like this cute $40 one pictured from Asos. You never know when you're going to go through a no service zone when you're driving through the country, so make sure to download the audio books, music, or movies that will be keeping you entertained before you leave. I use Spotify Premium to download my road trip playlists that may or may not include a lot of Celine Dion. I also utilize my public library's app to download books on tape, which is FREE. It's crazy to me that there are things in life that are still free. My brother got me a pair of nice noise cancelling head phones a couple years ago and they have been CRUCIAL to plane rides and road trips. Crying babies? No problem. Loud people in the row in front of you? Easy breezy. Obviously don't wear them if you're driving, but they go a long way to making you feel less like you're on a bus with 45 strangers. If you don't have the budget for fancy headphones, the little foam ear plugs do almost as well in a pinch, and you can get those cheap from amazon or most drug stores. I don't know about you, but I am militant about my beauty regimen. No matter how tired I am, or where I am, I have to at least wash my face, tone, and moisturize my mug. Lugging around tons of products is neither fun nor practical, so I take travel size toiletries with me. 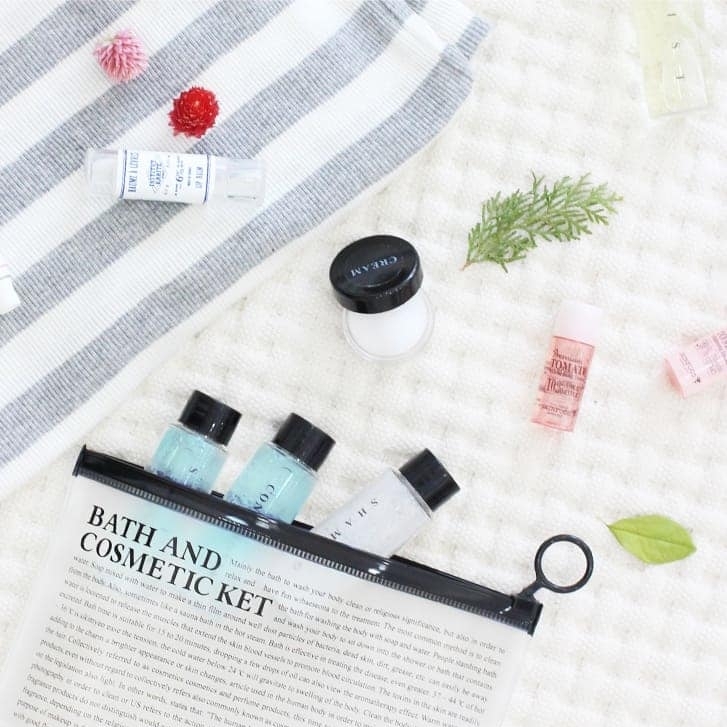 You can either buy small travel friendly containers or wash and re-use old samples or hotel goodies and fill them with your favorite skin care products. I keep my makeup minimal when traveling, so I'll bring a multi-purpose lip and cheek stain instead of a full size blush, boy brow instead of a full pomade eyebrow, and tinted moisturizer in lieu of full foundation. Kit pictured is from Mochi Things. If you're driving, your first instinct might be to try not to drink much water so you don't have to pull over to use the restroom, but that is the opposite of what you should do! Traveling is hard work, and you should make sure to drink enough water so that you avoid fatigue and don't get dehydrated. If you'll be passing through multiple states or locations, make sure you check what the weather will be like! In the US, weather varies VASTLY from state to state, and often times visitors to my home city here in Los Angeles will be unprepared for chilly nights because they assume California is hot all the time! Though GPS and smart phones have made paper maps all but obsolete, you should always plan for the unexpected. Technology often fails us, and you don't want to be stranded in the middle of nowhere if it does. Take a moment to look at what route you'll be taking and look at a map of where you're going before you start on your adventure, so that if for some reason your phone or GPS poops out you'll know relatively whether you should be going south or west on what freeway. Be prepared for anything! If your car breaks down, you'll want to make sure you have your insurance info or AAA membership on hand. Pack a small makeup bag with pain medication, allergy pills, band aids, and whatever you think may be important if you get into a situation. Use your smart phones Emergency Contact feature to plug in any medical information like allergies or diseases and fill in your bestie's info. You probably won't need to use any of this, but if you do, you'll be glad you prepared for it ahead of time! Hopefully you find these tips and tricks helpful, and if you have any other great tips to making a road/bus trip great, let me know in the comments! I will definitely be documenting my trip via my instagram, so be sure to follow me @slumberpartybeauty if you are interested in following along! Whether you are traveling or staying cozy at home, I hope you have a happy holiday season spent with people you love.